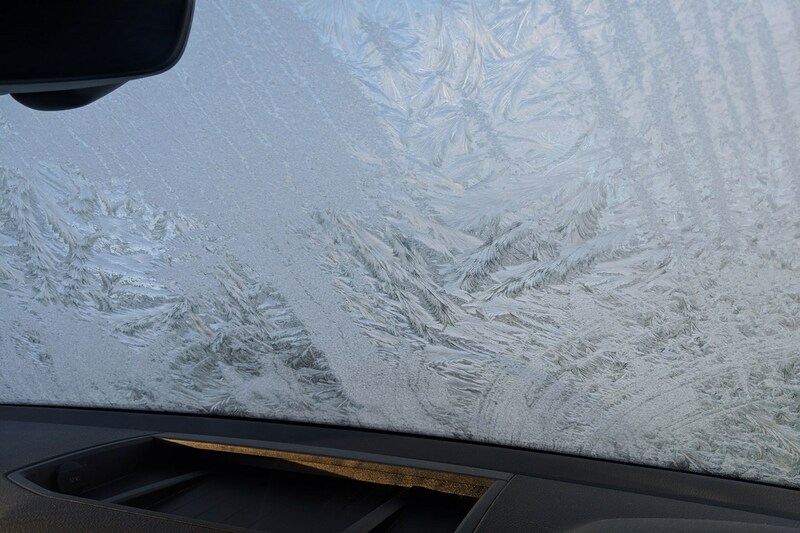 This week’s update: The temperatures have been dropping, the ice has arrived and Gareth’s been checking out the Amarok’s talents as a countryside cold weather companion. A winter winner? Our latest long-term test concerns something a little different. 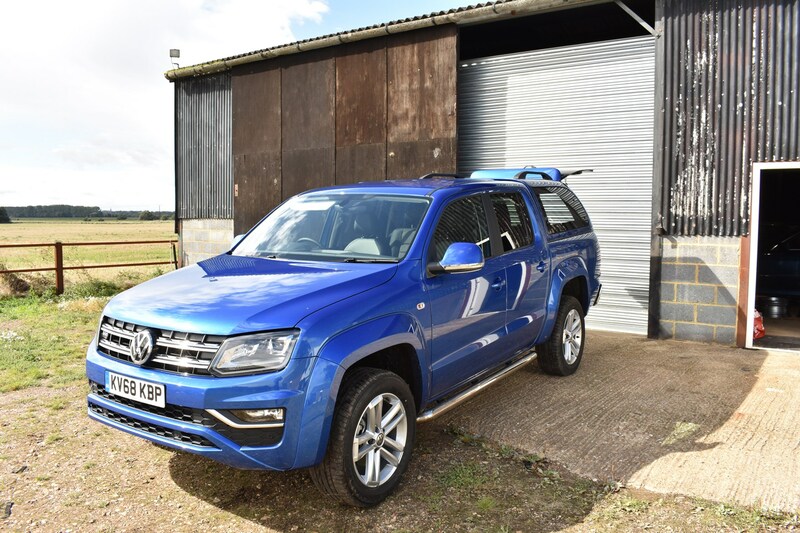 The VW Amarok pickup is a vehicle built to work – it has off-road capability, over three tonnes of braked towing capacity, a one-tonne payload and a motor with titanic torque. 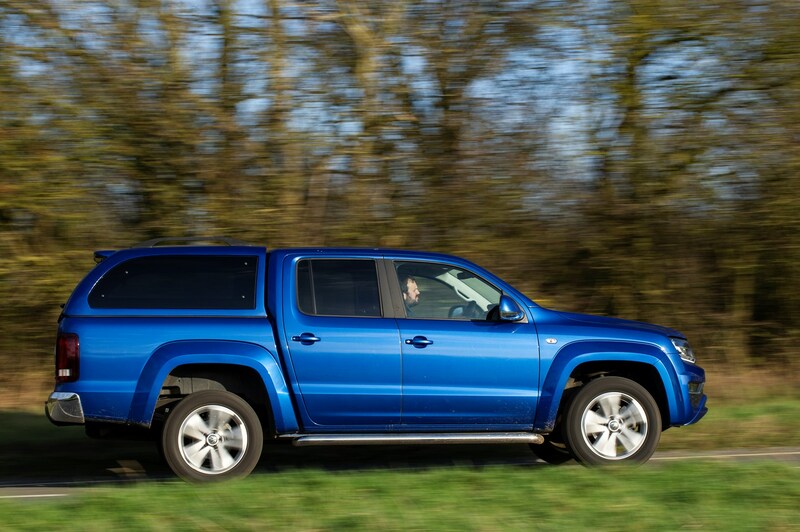 Why is a VW Amarok pickup a good family car? Put simply, it’s more practical than an SUV in a lot of senses, particularly in this case because we’ve got one with a Truckman hardtop on the rear load area. This effectively makes the rear of the car a huge boot, rather than an open tailgate. As you can see in the video above, the Truckman cover also means a handy split tailgate. The biggest issue I can see moving forwards, however, is that the upper hatch doesn’t create a tight seal, so anything left in the back will be somewhat open to the elements. 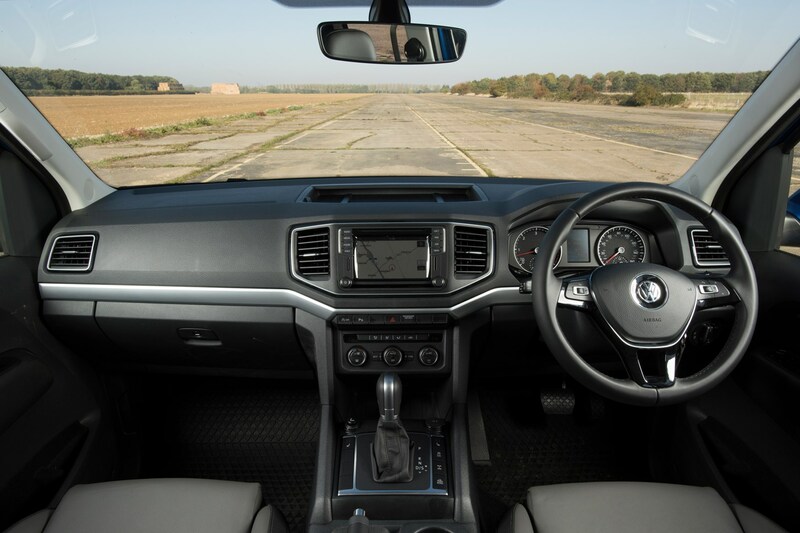 In front of this huge cavern of a boot, you’ve got a double cab setup that offers loads of room for four adults, a pair of VW’s extremely comfortable ErgoComfort electric front seats and a touchscreen sat-nav that features Android Auto. We’ll be putting all of those aspects to test to see how they perform. We’ve got the best of the bunch here. 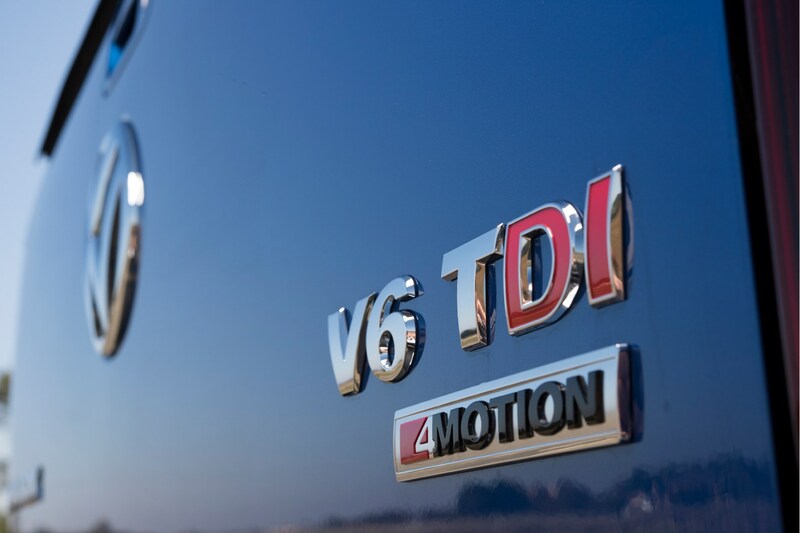 Our Amarok has a 3.0-litre, V6 turbodiesel engine with a whopping 258hp and 580Nm of torque. Its output will even increase to 272hp for brief periods in ‘overboost’. This is one seriously high-performance pickup. We’re looking at a 0-62mph time of 7.4 seconds, which is eye-raisingly rapid for a vehicle weighing in at 2,178kg unladen. Top speed is 127mph. Volkswagen claims fuel economy of 33.6mpg is possible, so it’ll be interesting to see how close we can get to that figure. For the transmission we’ve got an eight-speed automatic. Lower-powered engines have a six-speed manual as standard, but an auto is your only option on the higher-spec Amaroks. All come with a permanent four-wheel drive system, however, and unlike many pickups the Amarok can be driven on-road in 4x4 mode. What spec is our VW Amarok? It’s in Highline trim, which at time of publication is the second highest on offer, sitting below Aventura in the range structure. We’ll delve into the specs in more detail in the next update, but suffice to say the standard kit has been upgraded with a suite of optional extras that we reckon make the Amarok an excellent road car as well as a capable off-roader. 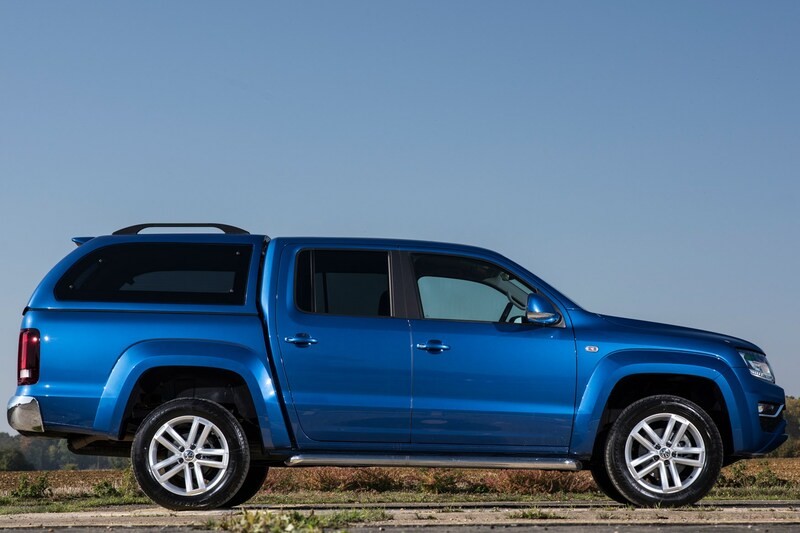 With a 3.0-litre twin-turbo V6 diesel engine under the bonnet, you might expect the Amarok will be expensive to run. But there’s a big tax benefit in running a pickup – just as long as you're able to register it as a commercial vehicle rather than a private one. In that case you’ll have to pay a flat-rate benefit-in-kind liability of £3,350 per year. That means if you pay tax at 20% you’ll be in for £670 a year, or £54 a month. Now, given its £47,627 on-the-road price including options, we’ll see just how much cash you’ll save if we look at the BIK costs of an equivalent spec of Touareg – VW’s largest SUV. 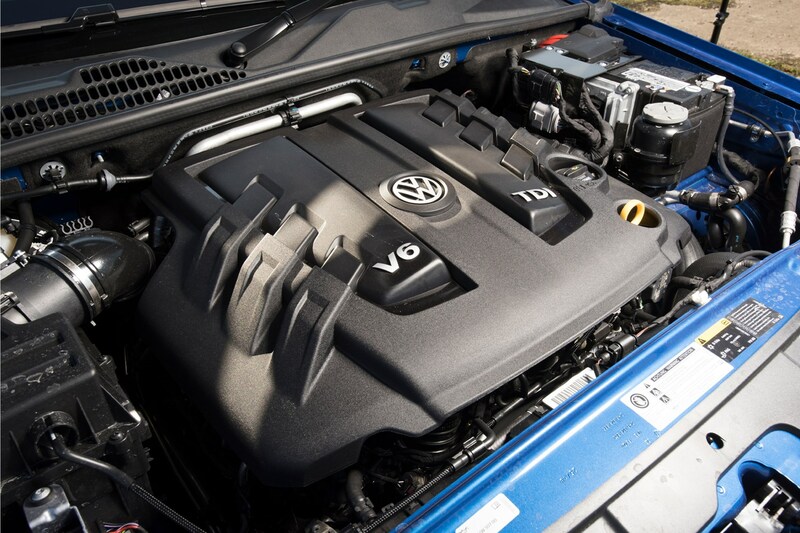 The Touareg SEL with a 231hp version of the same V6 as our Amarok costs from £48,995, so around £1k more expensive, and monthly tax bills are £294 a month assuming no optional extras. A flat rate of £633 is applied to taxable fuel bills too – a figure that is also multiplied by 20% or 40% depending on your salary. This often works out cheaper than a conventional company car, as they have a rate set at £22,600, which is then multiplied by your car’s BIK tax band and your salary tax banding in the same was as BIK tax. 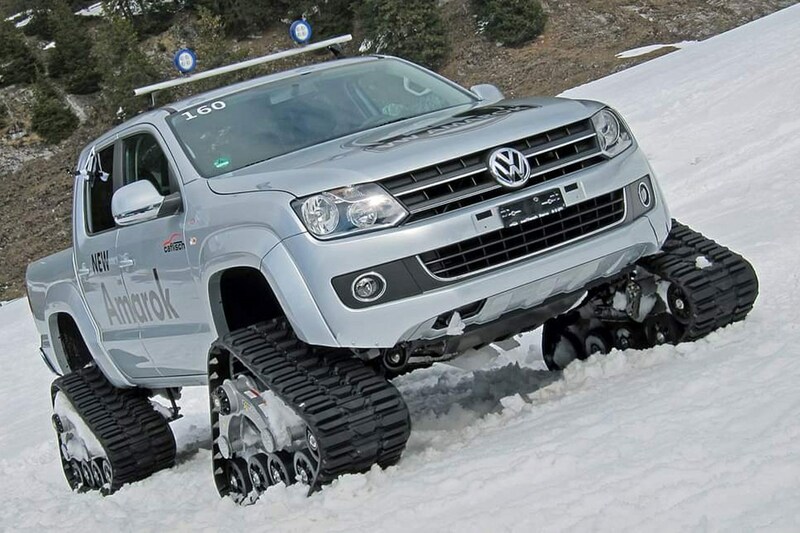 Furthermore, there are advantages for businesses in buying an Amarok. You’re able to reclaim the VAT back on one, for a start, depending what proportion of the miles the vehicle covers are for business mileage. If you drive 70% business miles, then you’ll be able to claim 70% of the VAT back. If you only use it for work, you can claim 100% of the VAT. Of course, before taking the plunge yourself given the above, it’s advisable to talk to your accountant about your own personal circumstances and exactly how much you’ll pay. 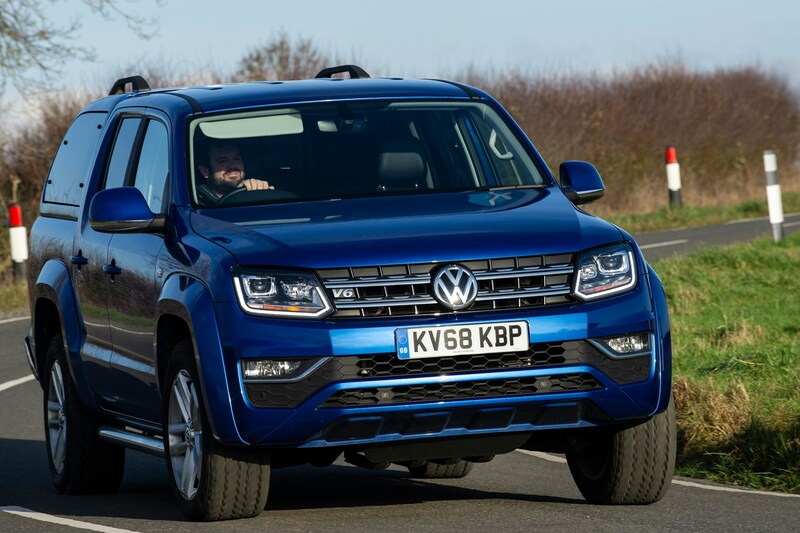 Amarok takes on Touareg – pickup or SUV? 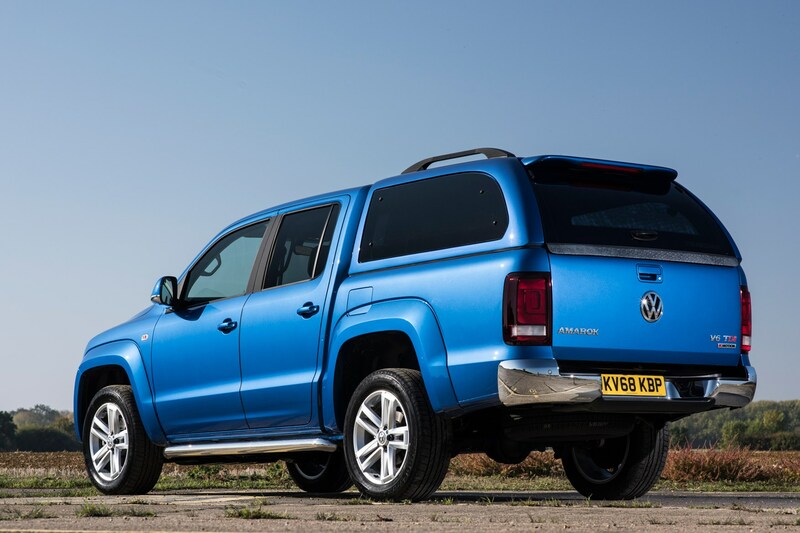 Plus lots more besides – stay tuned for update two where we delve further into our Amarok’s specification. Update 2: Should we have gone to spec-savers? 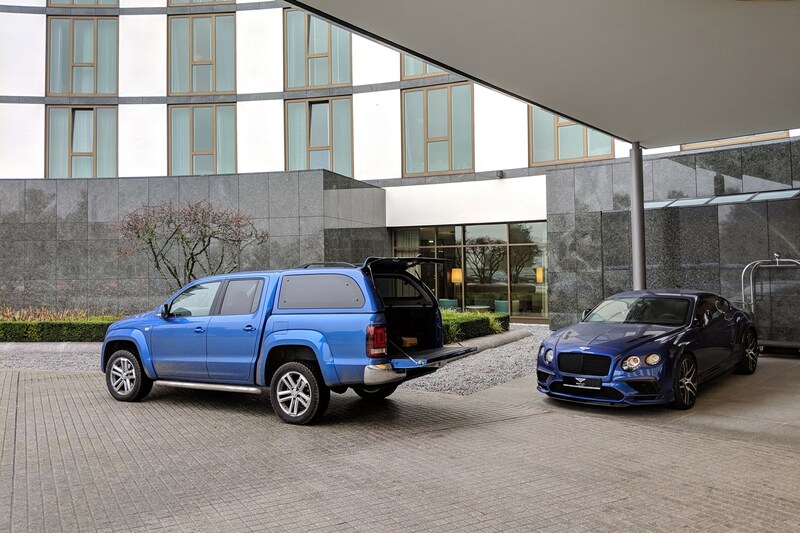 Since we’ll be using our Amarok more as an SUV than a towcar or proper off-roader, we picked one in a high specification. The bottom line is a list price of £47,627(including VAT), and some rather expensive PCP fianace if you're considering buying that way, but what exactly do you get for your cash? It also happens to be the most powerful mainstream pickup money can buy, at time of writing. That’s a startling set of stats. Chiefly, the 0-62mph time belittles many modern hatchbacks, but it’s that torque figure that makes the most difference on the road. You’re able to pick up serious speed for overtaking in no time at all. But more on that later. 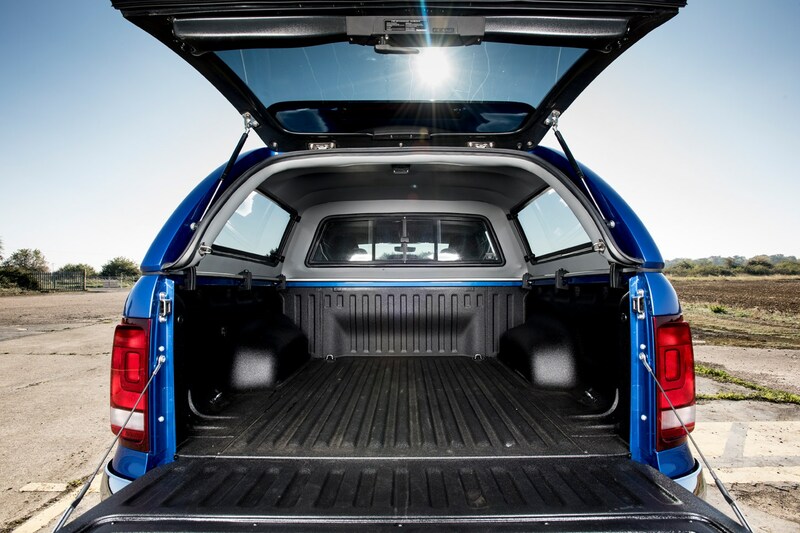 What’s included on a VW Amarok Highline? A decent spread of toys, as you’d expect for just shy of £43k before options, or a monthly PCP price of £759.20 with a £2,000 deposit and 10k miles per year over 36 months. But that little lot is only scratching the surface. 19-inch Cantera alloy wheels (£540) – will these harm the ride quality? 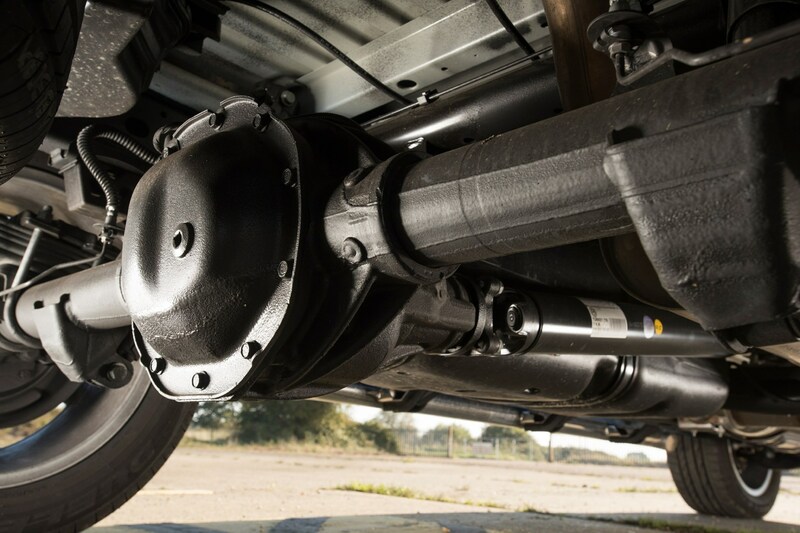 Load compartment protective coating (£828) – will our plans make this a necessity? 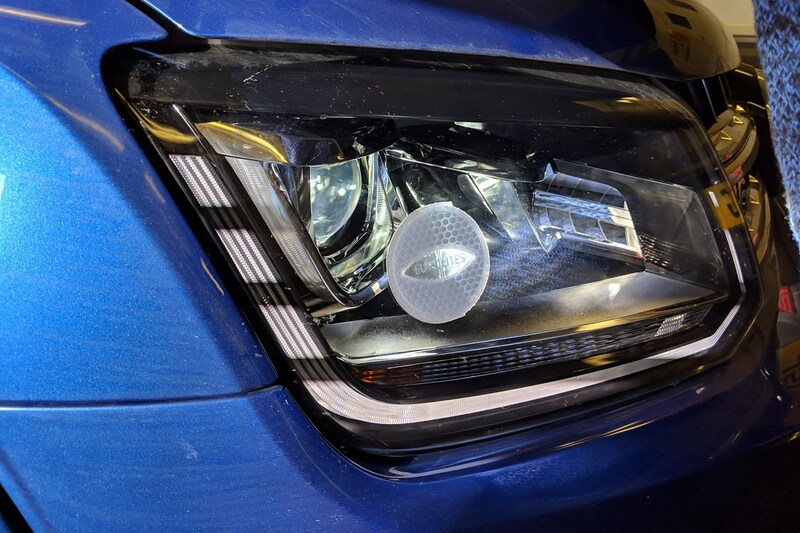 Lights and Vision package (£222) – automatic headlights and windscreen wipers can only be a good thing, right? 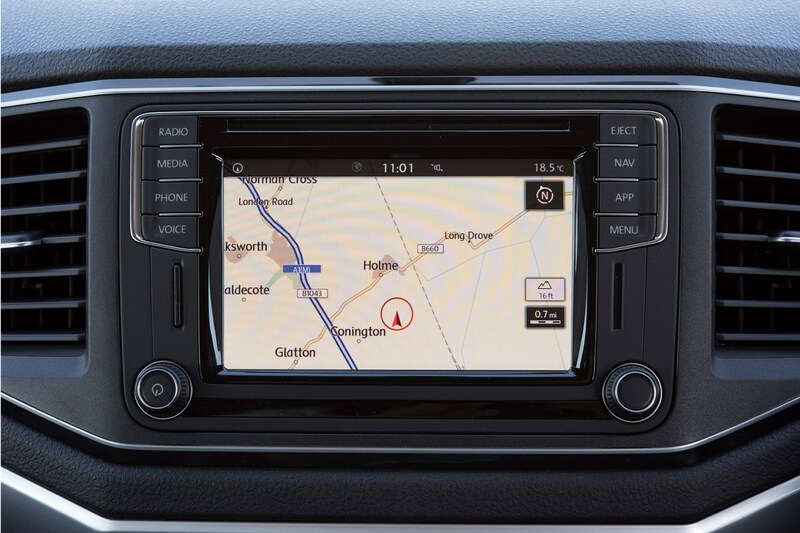 We’ve also got the Discover Media Navigation (£684 - pictured below) system on board. This nets you a high-level infotainment package with DAB, aux-in, USB and Bluetooth connections along with voice control, built-in sat-nav and an App-connect feature to link a smartphone. 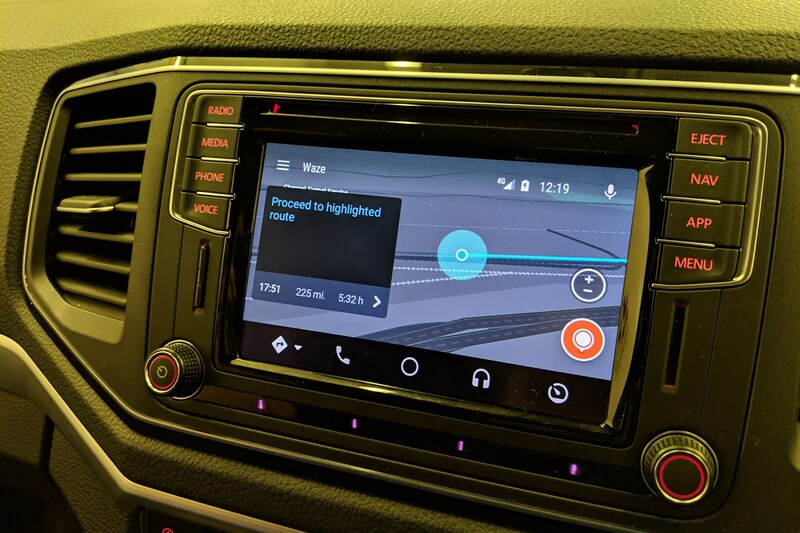 But this also comes with Android Auto – Google’s smartphone driving app – which means I’m able to use Spotify music streaming and Waze crowd-sourced navigation. It needs my mobile to be hard-wired into the Amarok via a USB cable, but I’m looking forward to checking out all the functions on offer. We’ve also requested two features that are available at the dealer. We mentioned the £1,904 Truckman cover that turns a pickup into a sort-of-SUV, and we’ve also put an order in for some winter tyres for our impending drive to Germany. More on those soon. I can’t remember the last time I bought a set of wheels for any of my cars. Seriously… I have spare sets of wheels of course, what petrolhead can be content with just one option? For most of my modern classics I have a set of ‘working’ wheels for year-round use and an automotive pornographic set, bought out for special occasions only. These latter sets are usually stashed away in one of my sheds awaiting refurbishment, out of the elements. It will come as little surprise to anyone who knows what I do for a day job (editor of Modern Classics magazine), that I prefer the delights of period correct, classic wheels rather than new ones. 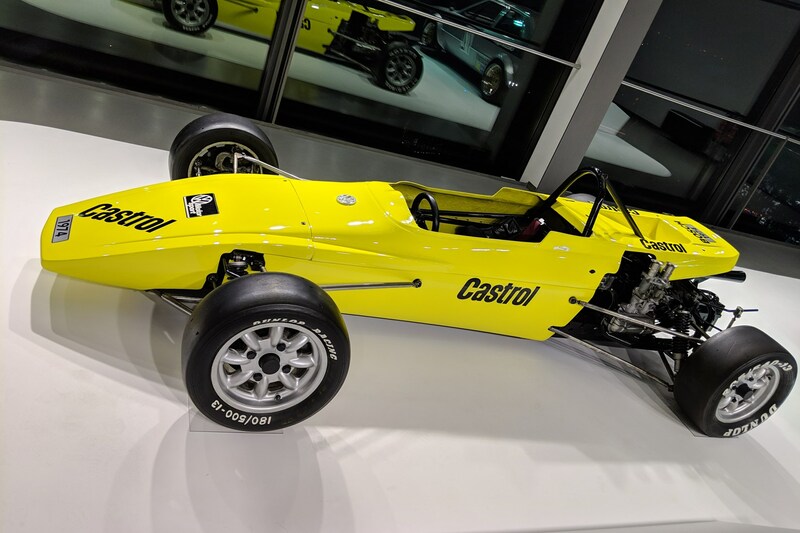 As my most up-to-date vehicle is a 2007 Volvo C30 and my oldest is a 1974 Opel Manta A – with eight others in between (mostly made in the 1980s) – you would be right to assume that I’m on first name terms with most wheel restoration firms within an hour of our office. 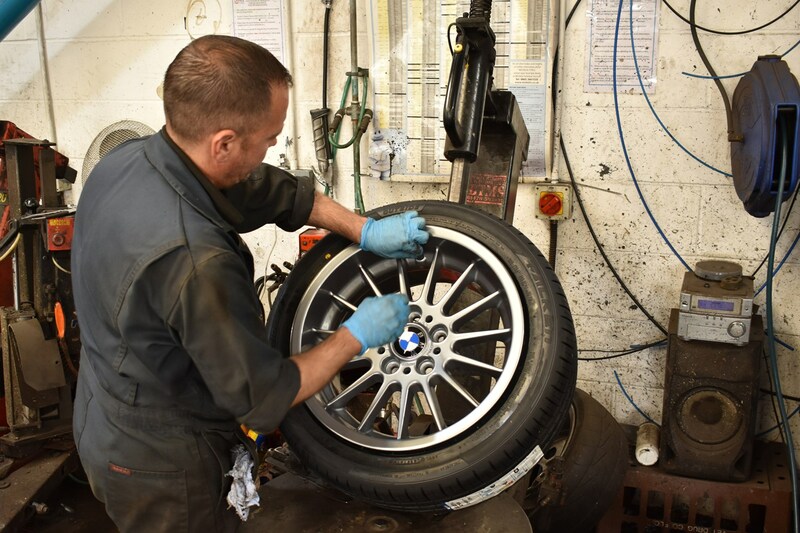 When I heard that a new branch of The Wheel Specialists had opened in Leicester, I was straight on the phone to proprietor David Stanley. 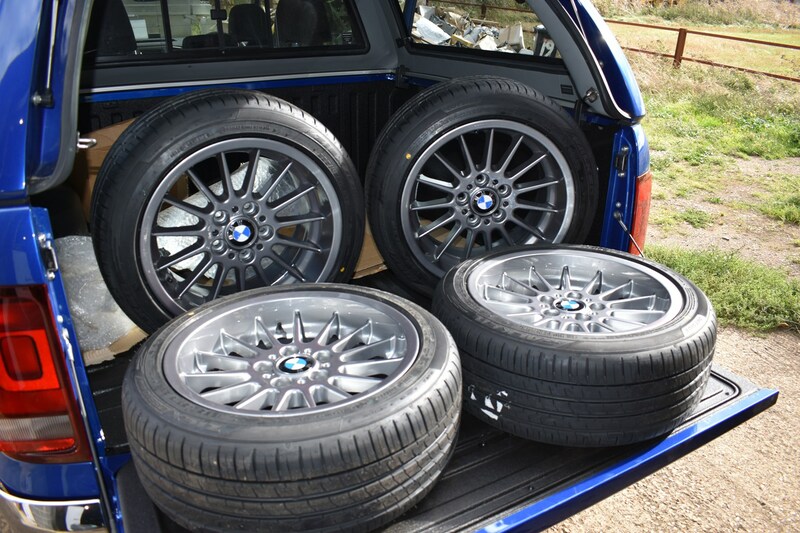 I had a set of BBS RZ wheels refurbished by another TWS outlet about six years ago. Despite my MkII Golf GTI 16V wearing these restored rims ever since, they have yet to deteriorate. So I knew these guys did good work. 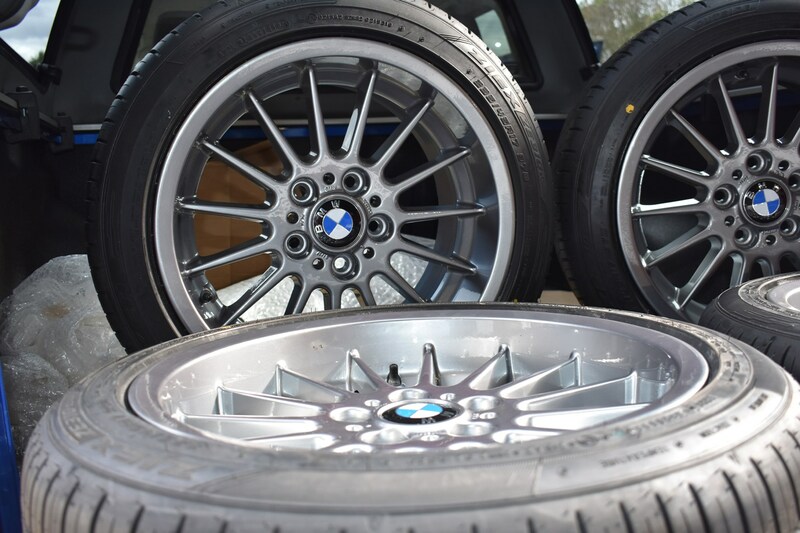 The shabby condition Style 32 rims on my latest project, a BMW E39 535i V8 were chosen as those in most dire need of remedial work. There was never any question of ditching these rims in favour of something else from the BMW stable. The turbine design of the Style 32 rims so perfectly compliment the big engine Beemer’s lines. It might be powered by a thunderous 3.5-litre quad-cam V8 engine but that doesn’t make it an M5, so I avoided the advice of many in ‘the flock’ who suggested the M5’s staggered rims as an alternative. No, I’m keeping this one standard. A date was booked for the refurb and even the colour of the wheels was decided upon by the time it suddenly hit me, how am I going to get the wheels to Leicester? This called for a vehicle with copious proportions, made to work. Fortunately, Modern Classics and Parkers desks are a mere 10 feet apart so I wandered over to Gareth Evans on the Parkers team and explained my dilemma. A wry smile came across his face: ‘What you need is the Amarok’. He was right; the big, flat-bed equipped Dub had no problem swallowing my rough set of Style 32s and their accompanying, new Falken ZIEX ZE310 tyres. The 40-mile trip over to TWS was a joy in the Amarok, which seemed much happier having some weight in the back than it had on the trip from the office to my workshop. The ride settled down and the luxury of the cabin appointments made it a comfortable and effortless place to spend the day. Who said working vehicles have to be miserable? The sat-nav diverted me to my favourite drive-through coffee outlet, the produce of which was easily stored in one of the Dub’s many cup holders, before finding the industrial estate on the outskirts of Leicester where TWS is based. The return journey proved just as straight forward with the heated seats taking the edge off the winter evening chill. Performance in this Amarok is stirring, there’s a great shove of torque available once the turbo finds its feet. It’s a surprise in a vehicle this size and causes a grin every time you exit a roundabout on to a dual carriageway. Of course, it’s made to haul substantial loads so it’s hardly breaking a sweat moving our rims around the East Midlands. While it isn’t built there, I’d had it in mind that I’d drive our Amarok from the UK to VW’s home town of Wolfsburg in Germany. There’s a facility there called the Autostadt that celebrates not only all things Volkswagen, but also the car industry in general. 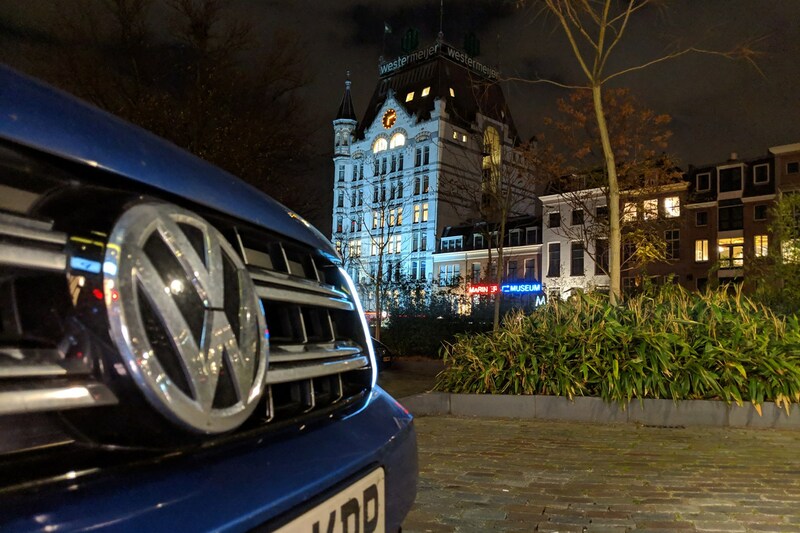 It seemed fitting, given the drive to the Amarok’s actual factory in Argentina is a rather more difficult trip to arrange – spanning the Atlantic Ocean diagonally as a starter for 10…. So we’re not doing that this time. But would this pickup be the perfect partner for our European road trip? 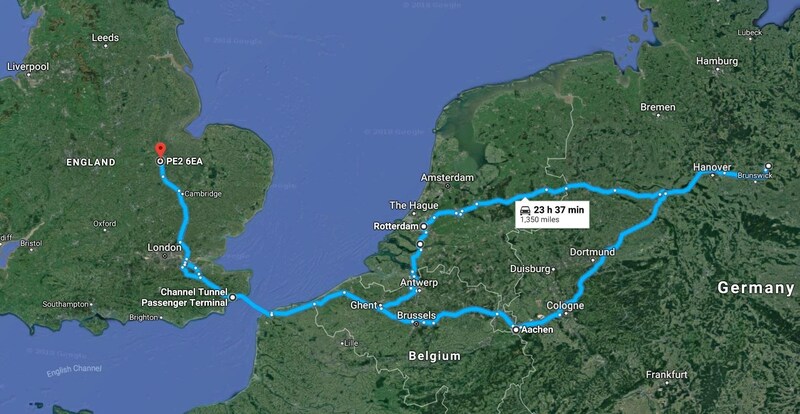 There’s a group of four of us going along for the ride – my wife and parents – and we’ll share the driving, so we’ll have more than enough experience of the entire vehicle by the time we get back to the UK. However, before setting off, the Amarok required some preparation. The tyres were the biggest issue, because if you’re unable to make progress in a vehicle in the snow in Germany then you’re in for a fine. We needed a set of winter rubber to insure against the Amarok getting stuck and an embarrassing conversation with a German policeperson. 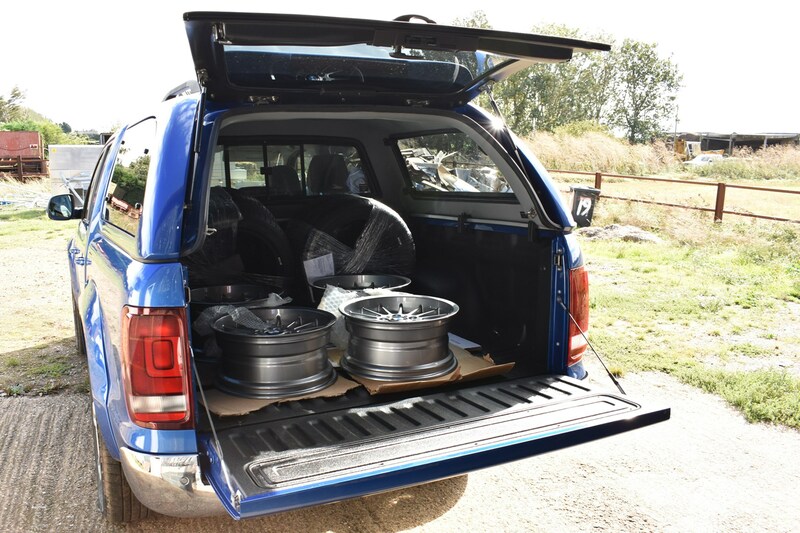 We went for a set of General Grabber AT3s in 255/55 R 19 size, to fit over the 19-inch alloys on the Amarok. These cost £156.20 each at time of publication, so £624.80 for the whole car. 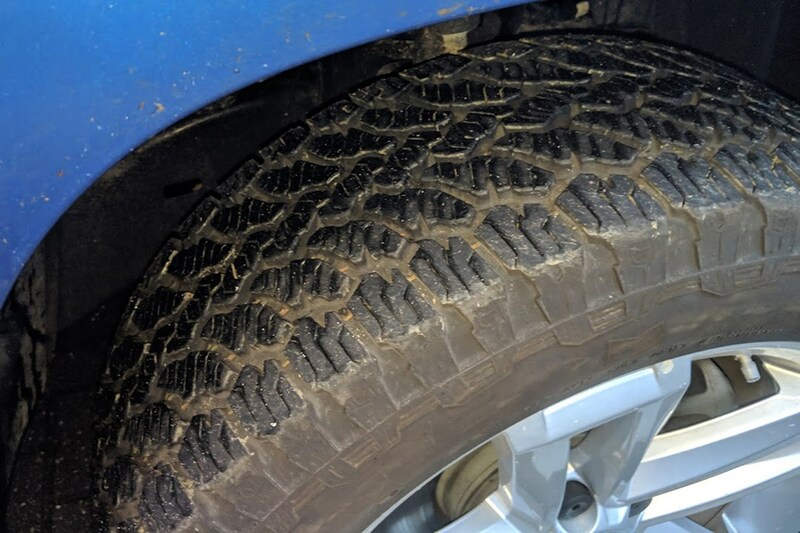 Our summer tyres are being stored and will be put on again after winter, so it’s not quite the financial disaster it first appears, as long as they last a decent while. It’s possible to get a few years’ use out of them, in theory. Immediately after installing the tyres, we had a long drive to Gatwick to see what the differences were back-to-back against the summer tyres we'd just removed. The lack of extra road noise was impressive, and the only drawback is slightly more fidgety cornering due to the taller tread blocks and more bodyroll thanks to the fatter tyre profile. I can live with driving slower around bends if I’m going to be able to get home in the snow. Still, fitting new tyres means checking the pressure was easy – something we should always do before a long drive – and the Adblue got a refill at the same time. Then I topped up the washer fluid and made sure we had the requisite kit for driving in France, Belgium, Holland and Germany – high-vis jackets for all four of us, a breathalyser, a warning triangle, spare headlight bulbs, headlight deflector and a GB sticker – and we were prepared for the off. 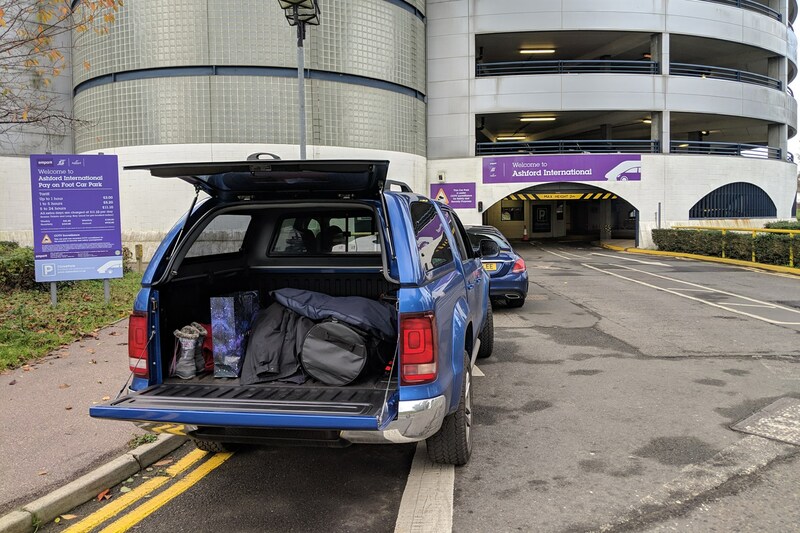 We’d agreed to meet at a car park at Ashford station because my folks were coming from Hampshire in another car, and this highlighted what is quickly becoming my biggest bugbear with the Amarok: anywhere I go I need to check it’ll fit, because its height with the Truckman cover and roof rails is 1,934mm and that’s over some car parks’ restrictions. It’s amazing how many car parks don’t publish this information, but thankfully the multistorey at Ashford International would accommodate 2.0 metres – our VW would just about squeeze in there. However, upon arrival we needn’t have worried, as it’s possible to wait outside the car park rather than having to actually crossing the threshold of the ugly concrete labyrinth. A quick three-point turn and it was off to the Tunnel. 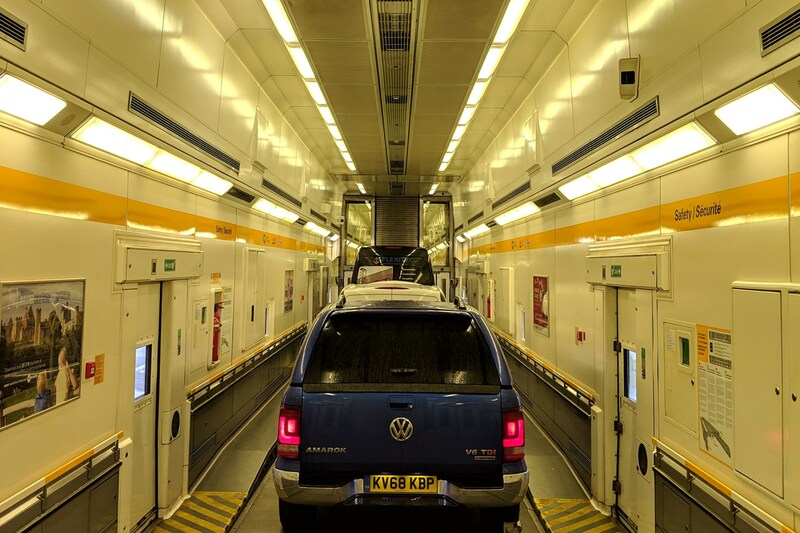 In the previous update I’d prepared the Amarok for its European excursion, and subsequently we headed towards the Channel Tunnel and the Continent. Having pre-booked a lunchtime train time, we simply pulled up to the kiosk and an ANPR camera read my numberplate and issued the ticket automatically. This is hung from the rear-view mirror in most cases, but the Amarok’s was too wide for the loop to go around. 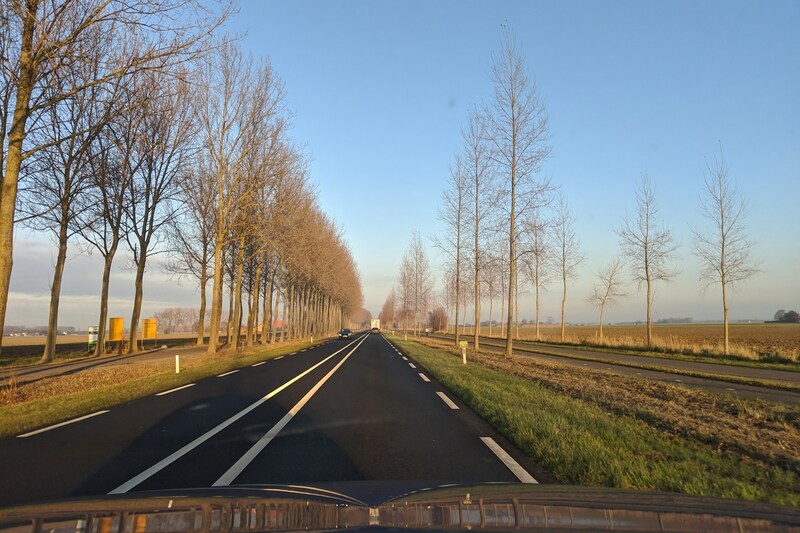 The short blast through France was mainly uneventful and soon we hit Holland. Since we were staying in Rotterdam the route took us northwards over some reclaimed flatlands punctuated with tunnels and spectacular bridges. The Dutch truly are masters of marine management. As we joined the main arterial route into Rotterdam two things happened. First, the light began to fade, and then we drove headfirst into rush hour. After a long day of driving the Amarok’s eight-speed automatic gearbox was the proverbial gift from god. Fellow owners have reported through social media that they think it’s a little slow to operate, but I’ve covered several thousand miles now and genuinely don’t think that’s an issue. 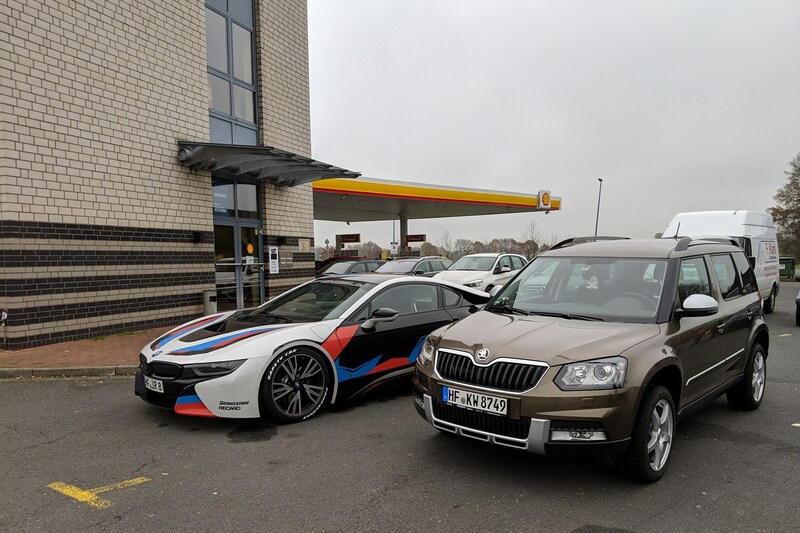 In fact, I think it has a pleasing amount of elasticity given the amount of torque it has to deal with, meaning in traffic at lower speeds it’s predictable and measured where some rivals are a little too abrupt. I was also thankful for the lighter steering these tyres (with their huge tread blocks) caused when threading the Amarok through the tight one-way streets as we neared the city centre. 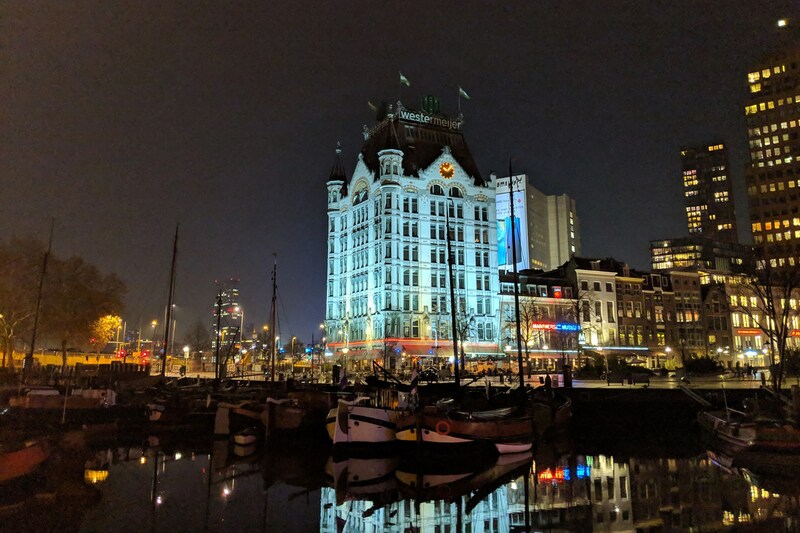 We parked on a side street 15 seconds from our hotel for the evening, amazed at how pretty Rotterdam’s old town was. 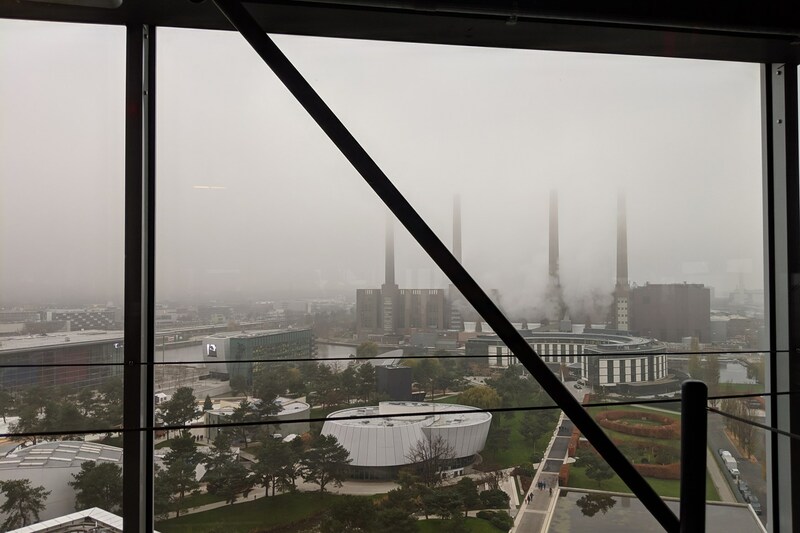 It was a misty, early start the next day as we had a long jaunt to Wolfsburg ahead. We agreed it was a shame to leave Rotterdam having seen so little of it, though: it’s on the list for a city break in its own right. The traffic was bad again as we negotiated our exit from the city centre, but the further we got the faster we could drive. A brief pause for breakfast in a dystopian truck stop (a mistake) and a driver change, then we pointed our VW towards Germany and its awesome autobahn network. The mileage was really starting to rack up now, but we didn’t have to spend much time at fuel stations because the Amarok’s range knocks on for 500 miles if you’re driving at a constant speed – enough to easily pass between regions in one go. 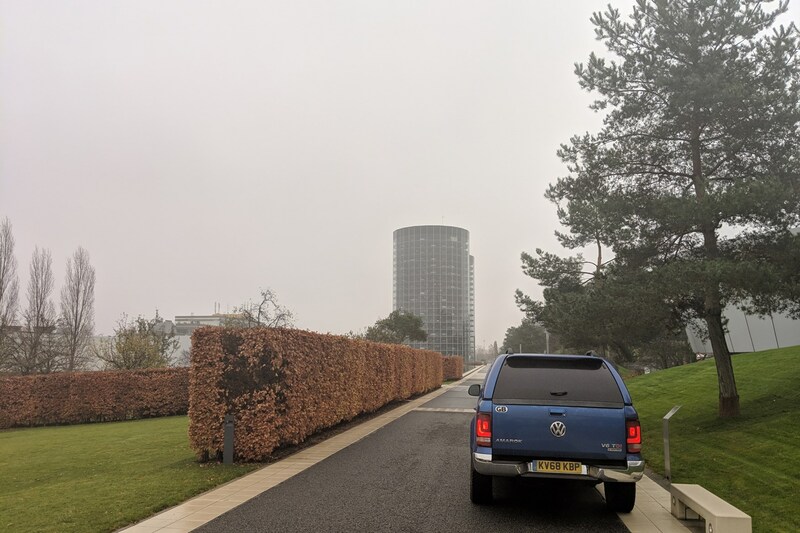 Another couple of hours of driving followed, the Amarok easily keeping up with the majority of autobahn users – with its 272hp on overboost you’d expect it would – and we arrived at Wolfsburg at 2:45pm, parked the pickup for the night and got ready for our tour of the iconic Car Towers. 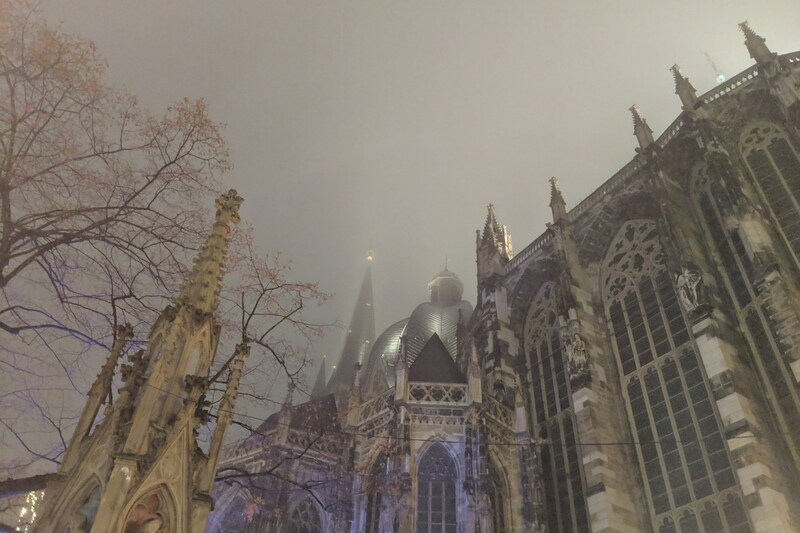 This was one of the reasons I’d wanted to visit the city – it’s absolutely unique. The towers are actually full of customer cars. 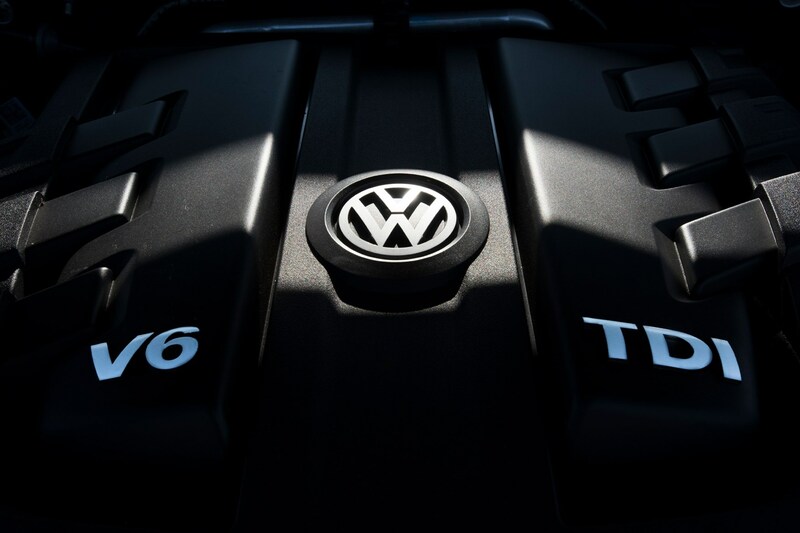 When you order a VW, you’ll get the option to come and collect it direct from Wolfsburg, and you’ll even get a discount as delivery costs are negated. One in three cars VW sells go through these towers, which gives you a sense of how popular this facility is. 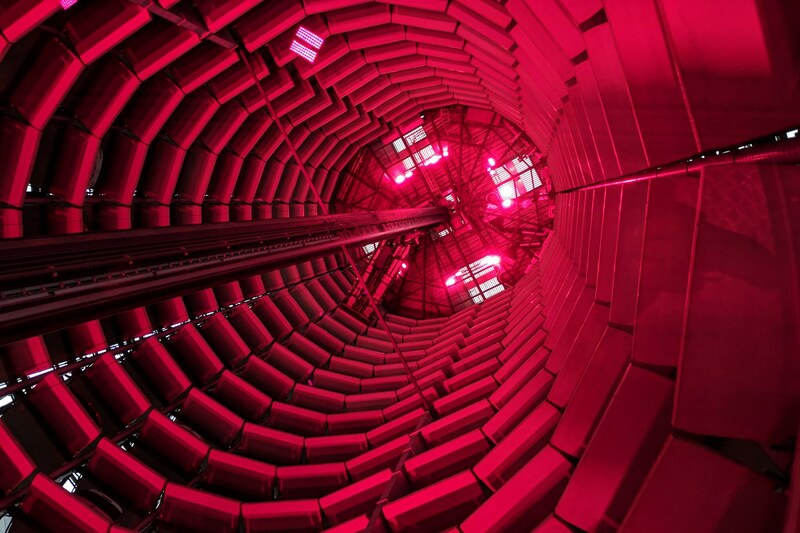 There are 400 cars in each tower, and one leaves every 30 minutes. It’s a busy facility! The towers were lit in pink and green to reflect the colours of the top-flight football match being played in the stadium next door. VW’s city has its own soccer team too. 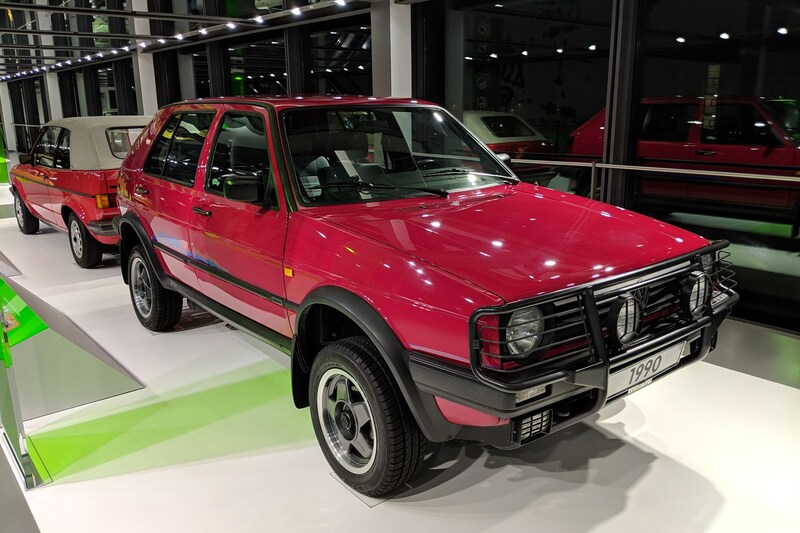 However, sadly you can’t collect a car if you’re a UK buyer, because the car must be registered when it arrives in-country, meaning you’d have to ship it to Britain, register it, then get it back to VW’s HQ. Not in any way efficient. We had a stunning, if foggy, view from the top of the tower (above), taken to the top via one of the robotic arms that usually carries the cars in and out of their positions. Our next destination was the Autostadt, which is a sort of car-themed amusement park to showcase everything VW. Inside there are countless exhibits, shops and restaurants, all around the theme of motoring. 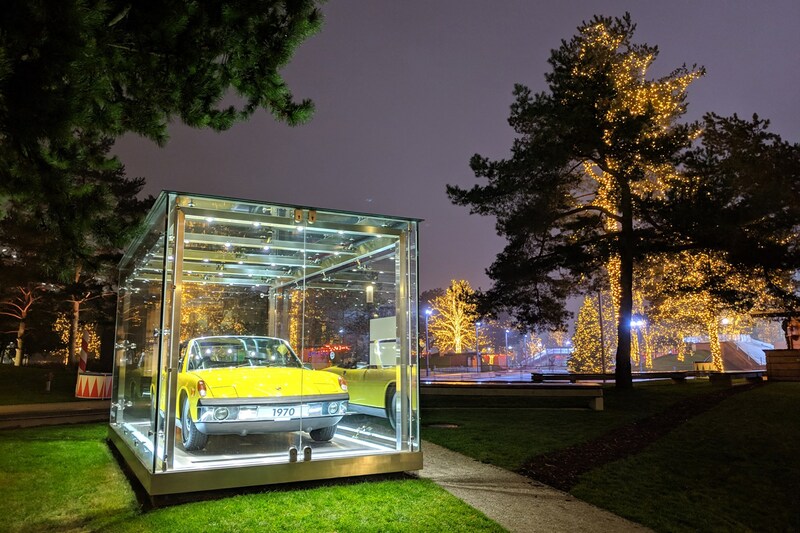 In the morning there was barely time to appreciate the amazing cars at the hotel’s entrance before we had to make a move towards a final stop – the Christmas market in the medieval city of Aachen, just this side of the Belgian border. 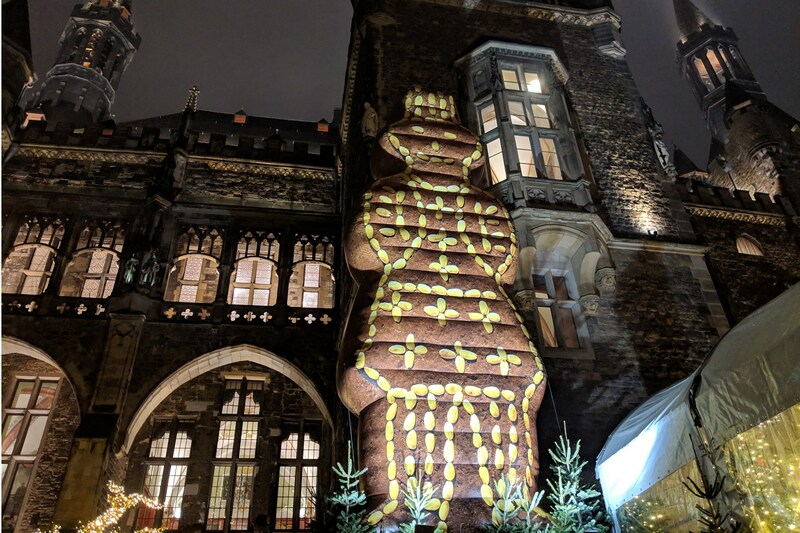 It’s a stunning city and one I’d implore you visit, but particularly through December when one of the world’s best yuletide events takes place here. Then it was another pre-dawn start to get back to the Channel Tunnel in time for our train, weaving through Belgium and France in quite a hurry. In fact, we got so worried about our ETA at one point that we were convinced we’d miss our 12:20 train. A quick Google, however, showed an interesting fact: you’ve usually got two hours of leeway. Good job we didn’t fork out £338 for a Flexiplus ticket, really! Anyway, we made it, and then ensured the inevitable crushing disappointment that is the UK’s god-awful road network for a further four hours to get home. 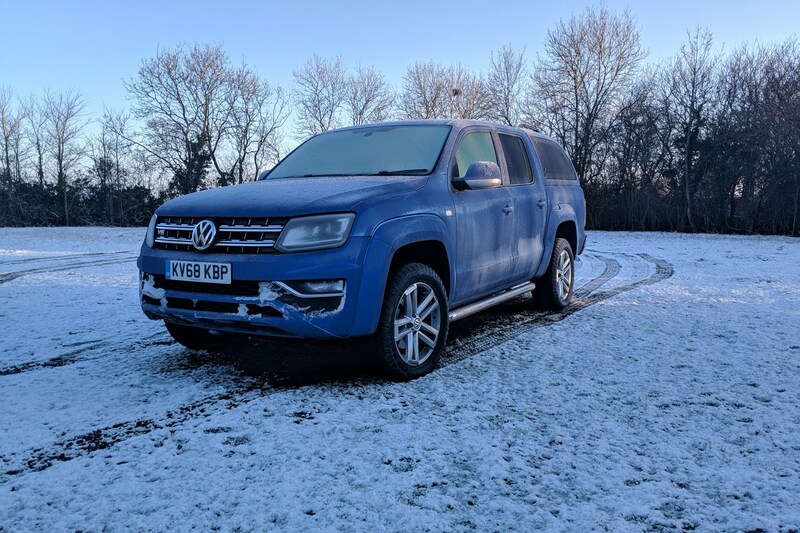 The temperatures have been dropping, the ice has arrived and Gareth’s been checking out the Amarok’s talents as a countryside cold weather companion. A winter winner? In the east of England where we’re based, you can hardly say it’s been a bad winter so far. We’ve had nothing approaching the infamous Beast from the East of 2018 (yet…), and the worst it’s got is just below freezing. However, that doesn’t mean the Amarok has gotten off scot free. Thanks to the unique way my local council is funded – i.e. : it’s all-but bankrupt at time of writing – they’ve inexplicably stopped gritting many of the roads on my usual commute to work when the mercury drops below zero centigrade. No problem for your voluptuous Volkswagen, I hear you say. Well no, and yes. With these off-road tyres around the 19-inch wheels, it’s unlikely I’ll get the Amarok stuck in mud or snow anywhere any time soon. Nevertheless, you can take the edge of the cold weather somewhat. I’ve got the Winter Pack thrown in as standard on my Highline Amarok, so both front seats and the washer jet nozzles are heated. This is great news once you’re moving, but it takes well over five minutes for the leather seats to provide discernible degrees on my derriere. In fact, the time it takes to heat the whole truck up is getting a little tiresome at times – particularly when it’s been sat overnight and I need to get to work. 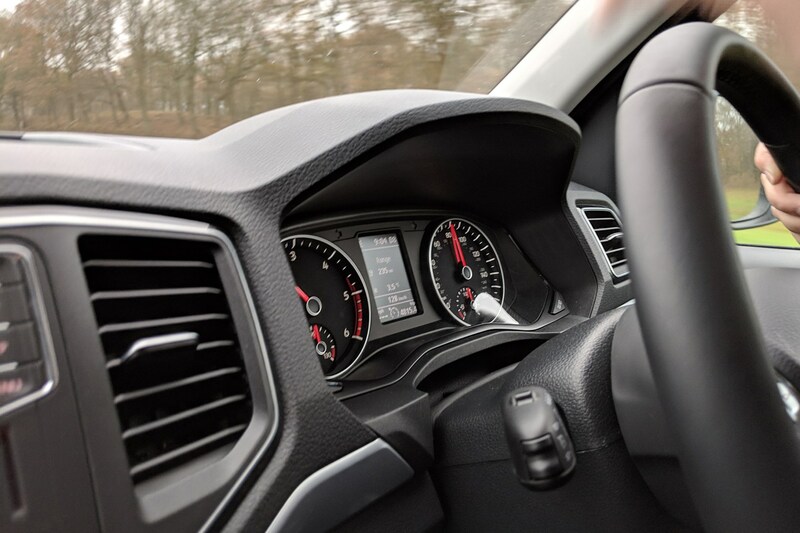 Volkswagen doesn’t have a heated windscreen for the Amarok (unlike some of its vans) and the huge V6 engine takes a long time to begin heating the cabin through the climate control system. That means I’m sat for five-or-so minutes while the truck defrosts its screen; I don’t like climbing up the front wheels and scraping ice off as my clothes get covered in muck. At the other end of the day, driving home in the darkness, I’m glad for the bright bi-xenon headlights but do wish they were a little cleverer. Automatic high-beam is something I’m missing, having driven countless cars with this simple system on-board, and since I live in the countryside it would be nice if they’d ‘corner’, or follow the direction of my steering, so I can see better around the next bend. Neither of these features are offered on the Amarok, which I find somewhat surprising given the type of vehicle it is. Still, I’m still absolutely blown away by the capabilities of this pickup. I reckon it’s the best you can currently buy for everyday life in the UK, despite the conspicuous lack of some non-essential options. And I’ve begun eating my breakfast in the driver’s seat while I wait for it to heat up, so the upshot is it’s saving me a bit of time too, all things considered.